Disclosure: Since I spent a LOT of time reviewing Mike Michalkow’s Drumming System, I would appreciate your support in buying lessons through a link on this page. You won’t pay a cent more, but I’ll receive a commission for my time writing this in-depth review, which helps fund this website (and my drum building obsession!). Thanks! This system is the culmination of 21 months of research and planning by Mike and the Railroad Media. When you practice something new you have to be patient. If you can’t get it today, put it down and come back to it tomorrow. On Setting up your drum set; there is no “right” way, you have to be comfortable. I love that Mike talks about the way you set up your drums, and your posture when playing drums. This is an important part of drumming, especially if you want to save your back in the long run! Stick grip technique: Matched grip – this is exactly the way I was taught…what the heck is Germanic grip, French Grip, and American Grip? Guess I better watch the rest of the dvd! Mike explains how to get different sounds out of your bass drum and hi-hat by using different striking techniques…this is pretty in depth stuff that most drummers may already do, but don’t know how to explain what they are doing. So far the first 1/4 of the 1st DVD has been about the equivelant to 2 beginner drum lessons. Extremely basic drum playing information, perfect for someone just starting to play drums. The DVD Package comes with 5 work books that are to be used with the DVD. This is extremely helpful for teaching drum patterns and learning how to read music all at the same time. I love that Mike actually teaches you 22 easy drum beats BEFORE he starts explaining drum notation and theory. For the beginning drummer, you just wanna rock and he allows you to do just that! THANK YOU for talking about the importance of using a metronome! – You are a drummer, you keep time, a metronome is a no brainer! You should expect to pay any where from $100-$200 for a good metronome. Don’t buy a cheap one. You’ll need it to have a head phone jack. Mike uses a Boss Dr. Rhythm. By the end of the first DVD you should be able to play along with a few of the included play along songs! The credits are proof that you’ll be able to play to the play along songs – As the credits scroll you see each person involved in the making of this DVD playing the drum beats they learned from the first DVD! Including video editors, graphic designers, executive producers and more! 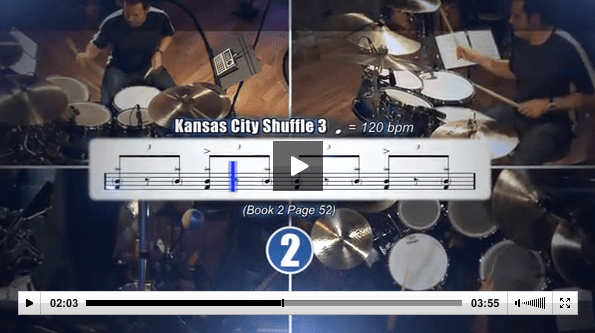 Check out the trailer for the Drumming System by clicking the image below! I never have had a very clear understanding of rudiments, and the rudiment section is one of my favorites so far. Clear explanations of each rudiment and the work book to show me the notation and sticking has been incredible for me to easily understand these rudiments. Rudiments are amazing. Why has it taken me 16 years to realize this!??? The 7 stroke roll….that’s when it starts getting hard for me. My left hand hates me. My mind is blow by all of these rudiments. Very in depth stuff! The Triple Ratamacue actually is so hard after all! I am a sucker for learning how to play Latin and afro-cuban beats…and this is like a one on one lesson with Mike. I love this. Although this isn’t as in depth as Mike’s Latin Drumming System DVD, he basically teaches you how to play and be versilatle in a Lain drumming situation. Overall, I’m very impressed with this package of Drum Lessons. Mike has been teaching drums for over 20 years, and his Drumming System is the culmination of years of gigging, teaching and being taught. I have confidence that even non-drummer could become a GREAT drummer if they were to systematically practice exactly what Mike teaches in these lessons. I will definitely be re-watching parts of these DVDs from time to time. 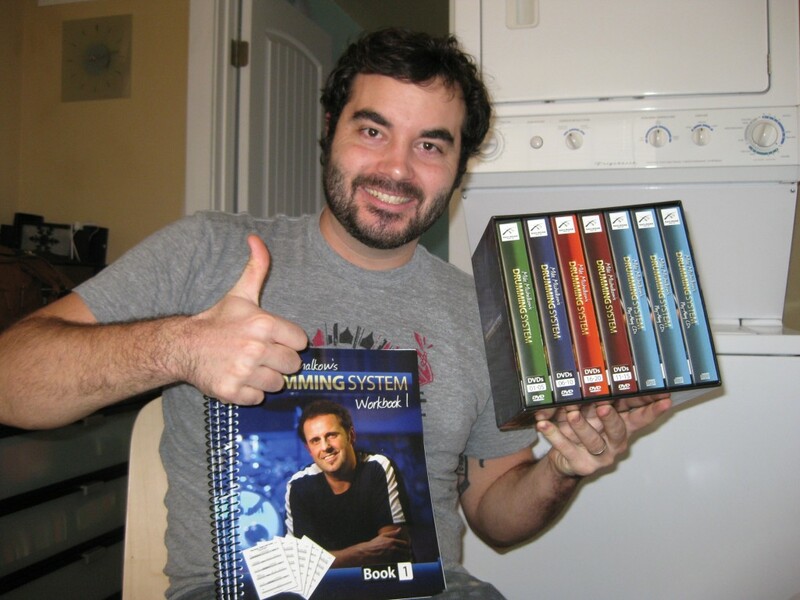 If you want to become a drummer, or become an even better drummer, I highly recommend getting Mike Michalkow’s Drumming System! Click here to learn more about the Drumming System! What are you thoughts on Mike’s Drumming System after hearing my review? Leave a comment to join the conversation! [..YouTube..] I already have it, it’s great. Thanks for the review. I already have it, it’s great. Thanks for the review. You make good videos man. Keep it up! [..YouTube..] Thanks Philip!! You Rock bud, all the best to you in 2012! Thanks Philip!! You Rock bud, all the best to you in 2012! [..YouTube..] GODdam! I learned to play drums from a video of Mikemichalkow! GODdam! I learned to play drums from a video of Mikemichalkow! [..YouTube..] Thanks Mike! You are the one who rocks my friend. Thanks for the great drum lessons! Thanks Mike! You are the one who rocks my friend. Thanks for the great drum lessons! [..YouTube..] I’d like you to do a review on the Latin Drumming System. I come from Peru and I am very fond of many latin drumming styles (because I love them. Actually there are quite a few latin americans who prefer drums for blast beats or funk than some latin american rhythm), and for what I have seen in the trailers in youtube about this Latin Drumming System, I don’t really feel like spending my money on it. Mike is a good drummer in my opinion, but latin is certainly not his thing. I’d like you to do a review on the Latin Drumming System. I come from Peru and I am very fond of many latin drumming styles (because I love them. Actually there are quite a few latin americans who prefer drums for blast beats or funk than some latin american rhythm), and for what I have seen in the trailers in youtube about this Latin Drumming System, I don’t really feel like spending my money on it. Mike is a good drummer in my opinion, but latin is certainly not his thing. Thank you Drummers! It’s an honor to be an inspiration to you all! All the best to each and everyone of you, and best of luck in your drumming ventures! thanks for this video review! i’ve ordered and can’t wait for my package to arrive!